All natural ingredients. 2 calories per cup. Sugar free.What does it taste like? 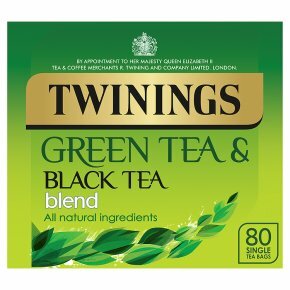 To create this delicious and invigorating blend, we have brought together the best of both worlds; the crisp, light flavours or green tea and the lively, bold notes of rich black tea. What makes this tea different? Years of experience have been poured into this charming blend, using the finest leaves and buds to take you on a journey to discover the distinctive flavours or two of the best loved teas. This perfect combination brings a unique twist to your green tea, providing a satisfying and refreshing cup, ready to brighten your day. How do I drink it? We suggest brewing this tea for 2-3 minutes, any longer and you may lose the delicate taste. Allow one single tea bag per person, boil the kettle and let it cool slightly before pouring. Enjoy with or without milk, as you prefer.